Non-Darkening Acrylic Sealer was developed to lessen and in some cases completely rule out the “wetting” or darkening effect caused by the application of clear coatings to natural substrates. Concrete, brick, stone, and masonry substrates generally take on a “wet look” or darkened appearance once anti-graffiti clear coatings are applied. This is because these coatings generally inhibit the reflection of light coming from the surface to our eyes. Non-Darkening Acrylic Sealer “primes” the natural stone or concrete surface, promoting inter-coat adhesion whilst reducing coating absorption, this reduces darkening and can greatly improve spread rates and coverage. 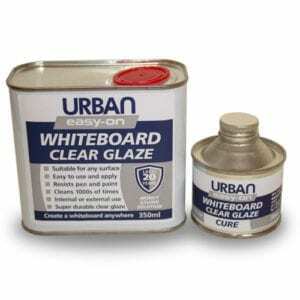 Non-Darkening Acrylic Sealer is especially effective when used as a paint primer for easy-on anti-graffiti coating. Prior to the application of easy-on Clear Glaze to natural stone or concrete surfaces apply one full sealer coat of the Non-Darkening Primer Sealer. This will minimise the darkening effect of easy-on Anti-Graffiti Coating and help to seal the porous substrate which in turn will improve coating coverage and spread rates. Similarly, prior to the application of Graffiti Magic Clear anti-graffiti paint to surfaces such as brick, stone or concrete it would be wise to consider applying this Non-Darkening Primer Sealer – especially if Graffiti Magic is to be used on listed, heritage or national trust monument sites. Graffiti Magic Clear Matt finish anti-graffiti paint looks especially good when used with Non-Darkening Sealer and gives an excellent finish to anti-graffiti coatings for concrete.